Here's our digital tourist Map, showing the top tourist attractions and info around Lake Maggiore, Lake Lugano and Varese at the foothills of the Alps in Northern Italy. Discover how visit Lake Maggiore (by boat) and Varese (by bus), where to go, what to do and see off the bike. Info about trains, navigation on the lakes and timetables. We are going to update the digital tourist Map quite often. Lake Maggiore is a large and popular lake in Northern Italy, north of Milan and west of Lake Como. The northern part of Lake Maggiore extends into Switzerland. The lake was formed by a glacier and is surrounded by hills in the south and mountains to the north, giving it a fairly mild climate all year. Lake Maggiore, Italy’s second-largest lake, is the longest lake of the Italian Lakes measuring (65 km – 40 mi) long, has a surface area of (215 square km – 83 square mi) but only 1 to 4 km in width, with a total distance around the lakeshore of 150 m.b It offers year-round tourist activities and a fairly mild climate, the lake can be visited almost any time of year. Borromeo Islands, three picturesque islands in the center of Lake Maggiore are popular with visitors: Isola Bella, Isola Madre and Isola Pescatori. They can be reached by boat. The most famous, in the Borromee group, is Isola Bella (Beautiful Island) with the 17th Century Borromeo Palace and a magnificent terraced garden. This is a true palace-island. A prized feature in a architectural system set up by the Borromeo family as a park of wonder. The Isola dei Pescatori (Fisherman's Island) has in fact been shaped into a rustic-island and the Isola Madre (Mother Island) was trasformed into a island-garden. Hermitage of Santa Caterina del Sasso, its position on Lake Maggiore is extraordinary and particularly spectacular, at the foot of a formidable rock cliff. Read more: Hermitage of Santa Caterina del Sasso. Laveno cable car, a comfortable two-seat cable car take you gently up almost to the summit of Sasso del Ferro (approx. altitude 1,100 metres) from where you can admire a magnificent view over Lake Maggiore, the Alps, pre-Alps and the Lake Varese. Read more: Laveno cable car. Monteviasco is a tiny village with no paved roads, no traffic lights, no cars. You can only get there on foot or by cable car. Monteviasco is perched on a hillside and appears like a remnant from an ancient civilization where the time has stopped. It's located in Veddasca Valley overlooking the town of Luino, just a few dozen kilometers in a crow fly from Lake Maggiore and close to the border with Switzerland. Read more: Monteviasco. Villa Taranto Botanical Gardens, at Pallanza, is world-famous for its magnificent gardens of rare flowers and plants. The lovely park of the Villa Taranto was created after the Second World War by a retired Scottish army officer, a botanist who collected plants from around the world to grow in this English landscape-style garden park. Read more: Villa Taranto Botanical Gardens. Villa Pallavicino Park, near Stresa, has large botanical and zoological gardens with many plant and animal species. Read more: Villa Pallavicino Park. Rocca d'Angera, the Borromeo castle overlooking Lake Maggiore at Angera, is a medieval fortified stronghold whose structure has been preserved almost intact. The castle was originally built by the Visconti family, rulers of Milan from 1277 to 1447. Read more: Rocca d'Angera. The colosse of Saint Charles Borromeo, overlooking Lake Maggiore at Arona. . Read more: The colosse of Saint Charles Borromeo. Lake Lugano is a glacial lake relatively smaller than Lake Maggiore that is situated on the border between Italy and Switzerland. It has a surface area of (48.7 square km – 18.8 square mi) but only an average width of roughly (1,6 km - 1 mi). Surrounded by green mountains that are reflected in the water and bordered by particularly beautiful beaches, the lakeside is dotted with small villages with colourful houses. Lake Lugano brings to mind the fjords of northern Europe, but with a mild climate. Morcote is the most beautiful village of Switzerland - 2016. The picturesque village on the shores of Lake Lugano prevailed over 12 contestants to win the title of “Most beautiful village of Switzerland 2016”, an annual competition organized by the magazines Schweizer Illustrierten. The church of Santa Maria del Sasso, an important Renaissance building with a late-Romanesque bell-tower offers outstanding views over Lake Lugano. With its typical houses with porches and "loggias", with its characteristic small alleys, the arcades of old patrician homes, valuable architectural monuments and its natural beauty, Morcote is considered “The Pearl of Lake Lugano”. Take a look at this video: Morcote. Monte Generoso is the highest mountain by Lake Lugano, at about 1700 m. A rack railway takes you from the lakeside resort of Capolago to the top of the mountain, with its panoramic views. Read more: Monte Generoso. Serpiano cable car takes you up to the sunny plateau of Serpiano, ideally located for visiting the UNESCO World Heritage Site of the Monte San Giorgio. The densely wooded mountain with its many rare plants is one of the main locations where fossils can be found dating from a prehistoric subtropical lake. Read more: Serpiano cable car. Swissminiatur , at Melide. is an open-air museum that, true to its name, renders all of Switzerland’s big landmarks in miniature. The park has 130 models of churches, manor houses, castles and landforms like the Matterhorn. These are mostly on a scale of 1:25 and wreathed in flowerbeds and woodland. You can see a miniature railway that wends through the park. This is 3.5 kilometres long and has 18 model trains zipping along its tracks. Also keep an eye out for the park’s funiculars, cars on the motorways and boats zipping over the lakes. Read more: Swissminiatur. The parks surrounding the villas of Varese are the perfect welcome to what is commonly referred to as the “garden city”, nestled in the foothills of the Swiss-Italian Prealps. 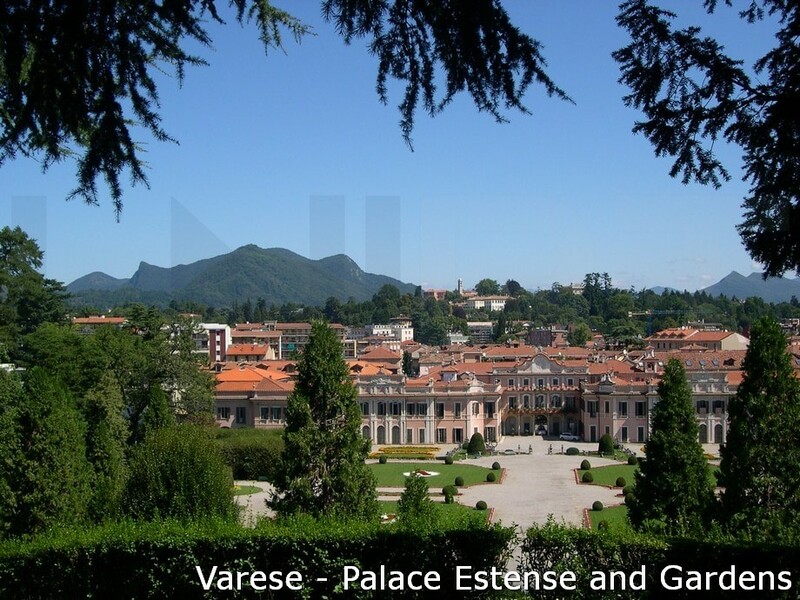 Read more: Varese. Varese is also full of different cultural places of interest. Villa Menafoglio Litta Panza is a 17th-Century villa which hosts the American contemporary art. It's a three-storey building with its typical Baroque "U" shap, it opens out towards a large garden ( 33,000 square meters) and it overlooks the town of Varese from the top of a hill. Learn more: Villa Menafoglio Litta Panza . Villa Della Porta Bozzolo, at Casalzuigno (Varese). Created in the 16th-century as a country villa, the Villa della Porta Bozzolo later became a noble company residence and was enhanced, in the first half of the 18th century, by an imposing Italian garden, among the most majestic and harmonious creations of green architecture surviving in Italy today. Learn more: Villa Della Porta Bozzolo. Arcumeggia, a small village near Casalzuigno (Varese). It is known as “Paese Dipinto” (Painted Town) or “Galleria all’aperto dell’Affresco” (Open-Air Fresco Gallery) since, in 1956, the locality was chosen, by the then Varese Province Tourism Association, as the base for the “Pittori in vacanza” (Artists on Holiday) show for the creation of frescoes on the external walls of houses by the greatest contemporary Italian artists. Learn more: Arcumeggia. The Monastery of Torba, at Gornate Olona (Varese), lies at the foot of the archaeological park of Castelseprio, dates back to between the 5th century and 6th century, when the tower was built and used as a Roman military outpost of the nearby camp. Learn more: Monastery of Torba. The village of Castiglione Olona (Varese), also known as the "Island of Tuscany in Lombardy", has ancient origins. It was a Roman military camp, then a village fought over by the Viscontis and the Torrianis, who, for a long time, sought to dominate this territory along the banks of the River Olona. The Renaissance was the period of greatest splendour for this place, due to the presence of Cardinal Branda Castiglioni. Learn more: Church of the Collegiata and Museum. Visiting the Shrine of Madonna del Ghisallo is a must do for every cyclist. There are places in the world that boast to be the spiritual home of cycling: the Shrine of Madonna del Ghisallo is one of these places. It lies at Magreglio (Como)strong> between the two branches of Lake Como. Read more: Shrine of Madonna del Ghisallo.